More gigs this week! December has been a pretty busy month for me. Tuesday was Tim Minchin at the O2 Arena. Having seen him on his last tour a stupid number of times, I had gotten a bit weary of seeing the same show over and over, so this was a welcome change. It was mostly new material, beefed out with a 40 piece orchestra and theatrics that can only come with touring arena-sized venues. Tim seemed to make it work, although I do miss the days when I used to see him in tiny 200 capacity rooms. The new stuff was very funny, and I especially enjoyed his religion-based rants and songs about taking things out of context. No doubt some of the dates on the tour have been filmed for a new DVD, so everyone will be able to enjoy it. 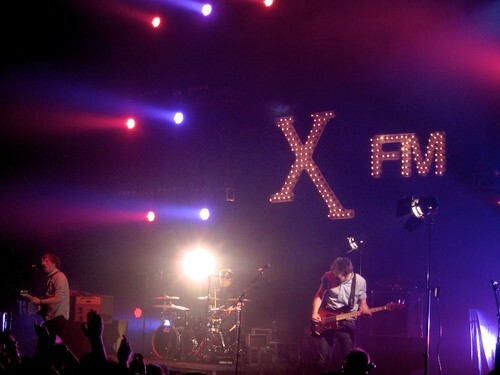 On Wednesday I went to Brixton Academy with my mum for the XFM Winter Wonderland. Due to tube fuckups we arrived late and missed all of Mona (not a great loss) and all but one song by The Drums. We slotted into our favourite position (front right, just by the middle barriers) in time to see Two Door Cinema Club. I hadn’t realised before just how many singles they had released, so it came as a surprise to me when all but one of their 6 song setlist was a single. The crowd seemed to enjoy it though and bounced around gleefully. The music may not be a work of genius, but it is very catchy and fun. Next up was White Lies, who surprised everyone else by not playing many singles at all. It was mostly tracks from their new album, which as it is released in January they are obviously very keen to promote. I’m not sure how well it went down with the XFM crowd though, as the audience seemed to thin out towards the end as people headed for the bar. I liked it and I’m definitely going to be getting a copy of their new album. 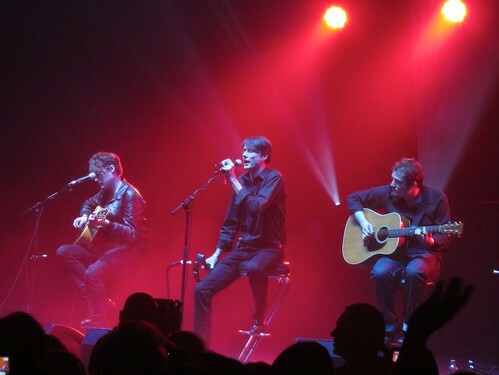 The penultimate act was Suede, who unfortunately had to do a quick acoustic set as their drummer was off sick. It was a bit of a disappointment for me as I had been looking forward to seeing them, but it was still pretty good. They played ‘Trash’, ‘Animal Nitrate’ and ‘Beautiful Ones’. Lastly it was time for the Manic Street Preachers who chose the right route and played a set consisting of their greatest hits, rather than tracks from their new album. 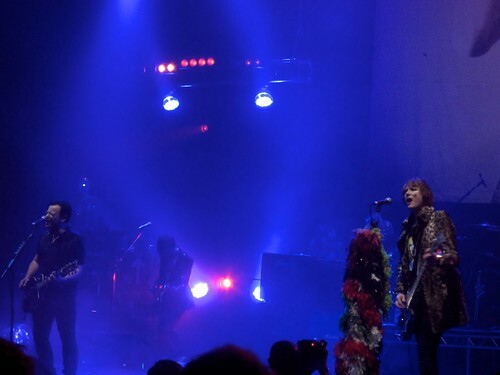 There were clearly a lot of die-hard Manics fans in the audience and everyone had a great time. It really got me excited for their rescheduled Brixton gigs next month. Since I got back from New York I have realised that my trusty 18-55mm kit lens is well and truly broken. It just won’t autofocus any more, despite trying various fixes from the internet. So I have decided, rather than just replacing it, to upgrade to a better, multi-purpose lens. And my investigations have led me to the Canon 15-85mm. I have found one on the Amazon marketplace for £400 but I don’t know whether to buy it now and risk being pretty poor for the rest of December, or wait til I get my Christmas money, by which point it may have already been sold. Decisions! I will be putting in an order for some new acrylic soon, this time in pink and silver. Just finalising the designs and then it will be sent off. There are some winter-themed pieces and small pink logos to be put onto each necklace chain. Last night I went to see Arcade Fire at the O2 Arena, but I don’t think words can properly justify the experience. It was simply sublime, and I really wish I was going tonight as well. From the opener ‘Ready to Start’ to the closing song, the whole crowd was with them 100%, dancing and singing along to every track as though their lives depended on it. Arcade Fire appeared to be humbled by the massive audience response and thanked everyone profusely for coming out in the bad weather to see a band who “haven’t even had a hit song”. The setlist was pretty evenly split between the new album and the previous two, and I was incredibly excited to hear them play ‘My Body Is A Cage’, which is one of my all time favourite songs. The segue from ‘Neighbourhood #3 (Power Out)’ into ‘Rebellion (Lies)’ is so perfect you would think they had planned it when they wrote the songs, and it is this combination that gets the biggest crowd reaction of the night. As the last strains of ‘Wake Up’ faded into the air, many people felt acutely aware that they had witnessed something special. It is a testament to Arcade Fire’s live show that they can make every gig they play feel unique, and I can’t wait to see them again. On Tuesday I went back to the O2 Arena (lots of gigs there recently!) to see Gorillaz. I was pretty excited for this gig as I’ve wanted to see them for a long time and not got the chance to before. I arrived late so I would miss the support acts, not a fan of De La Soul and I’ve seen Little Dragon before. I managed to get a position fairly near the front so I had a nice view. Gorillaz were really good, loads of guest singers and a big orchestra and brass band, but the crowd were rubbish. I was near the front, but people around me only knew the really big singles. The album went to number one so I had assumed that people would know the more popular songs off it, but apparently not. Compared to when I’ve seen Muse, or NIN or Placebo there when most people have known a good majority of the songs, it just felt a bit meh. I enjoyed myself anyway, but it is quite hard to have a good time, sing along and dance when no-one around you is moving. I think I’ll have to try and see them in a smaller venue next time, full of more knowledgeable fans. On Saturday I went to the Olympia with some friends for the Erotica exhibition. Unfortunately we arrived too late to see Dita Von Teese, but we had a fun time just walking around and looking at all the stalls and lovely corsets, and we got to see the main show at 8pm which was very interesting! This week I haven’t done much else really. I’ve been saving my pennies for New York and spending the rest of my time Simming! This week I have mostly been playing the new Sims 3 expansion, as my brother has received the new Call of Duty and has taken over our internet connection. Woe is me! I have created a vampire rockstar celebrity who has a penchant for tight leather trousers. I think he may be channelling Lestat. On Wednesday I had the day off work to go to the O2 Arena with my dad and brother to see Linkin Park. I was a bit apprehensive, as I don’t know much of their new material, but it turned out ok in the end. Does It Offend You, Yeah? were supporting which was awesome, and their newer songs sound better every time I hear them. Can’t wait for a new release! Linkin Park came on at about 8:30, which felt stupidly early for a gig! The first part was mostly new tracks, interspersed with a few choice hits to keep the crowd going. Then they got onto the better (in my opinion), older stuff and all was right. I felt like a 14 year old again screaming along to Crawling and One Step Closer! All in all it was an enjoyable experience, but probably not one I would pay for again as I really didn’t connect with the newer music. Plus we were on level 4 in the nosebleed seats, and I had to sit down every other song to stop myself feeling too dizzy. On Thursday night myself and a friend made our way to the Horse Hospital in Holborn for an exclusive PureHMV screening of the new Mighty Boosh documentary, The Journey of the Childmen. As we took our seats in the tiny room, we were delighted to find free boxes of popcorn and chocolate bars on our seats. Imagine our joy when we found out the bar was free too! Needless to say much alcohol was drunk, and by the time Oly Ralphe, Noel Fielding and Rich Fulcher appeared to introduce the film, we were quite merry! Although not as drunk as a loud woman at the back who kept calling out nonsensical things. The documentary was very enjoyable and was a nice look at the hectic touring schedule they experienced, with some pretty animation and odd bits thrown in. Well worth a Christmas buy. It was also rather surreal to watch it with Noel Fielding sat right behind me giggling at everything on screen as well. On Friday we continued the drinking theme with a night out in Colchester, and discovered an amazing bar that served shots from a teapot! Once you go teapot, you never go back.